The marriage between the captain of Indian cricket team Virat Kohli and popular film star Anushka Sharma had been long on the cards, as this romantic couple was dating for quite a few years now. Many speculations were done by the reporters about their wedding and finally, they chose to tie the marital knot on December 11, 2017. There are many interesting facts about this fairytale wedding of the star couple. 1. The entire phase of wedding arrangements and the wedding ceremony were hidden from the eyes of the media people. Thus, no news channel or newspaper reporter could cover this highly interesting incident. The wedding was attended only by the close family members and very intimate buddies of both the bride and groom. 2. This top-level wedding of two famous celebrities was organized in an ancient village of Tuscany, which is a hilly region of Central Italy. This place was reportedly chosen for its picturesque countryside landscape with hills and green valleys. 3. The couple maintained the Indian culture in choosing their attires for these wedding rituals. All their wedding dresses were designed by the famous fashion designer Sabyasachi Mukherjee. 4. A professional wedding planner was hired to take charge of the entire event and make it hugely entertaining for everyone present there. 5. The wedding ceremony was preceded by the functions of Engagement, Haldi, Mehendi and Sangeet, following the purely Indian traditions regarding marriage. 6. During the engagement ceremony, Anushka chose to wear a burgundy coloured velvet saree that was adorned with embroideries, zardosi works and tiny pearls; while Virat sported a blue coloured suit. As per the online published photos, Virat Kohli was seen to happily wear a simple yellow kurta and a pink scarf. However, the couple was seen to be more colourful during their Mehendi ceremony; where Anushka wore a lehenga of bright orange and fuchsia pink, with a blue blouse with multicoloured floral patterns. Virat also wore a white coloured khadi kurta and churidar, where a fuchsia pink jacket added hue. 7. The unique bridal dress designed for Anushka was a light pink lehenga with lavish embroideries of silver and gold zari threads, along with pearls and colourful beads. This graceful dress was matched with lots of heavy jewellery. Virat's wedding dress consisted of an ivory coloured silk sherwani and a matching silk safa or turban. 8. 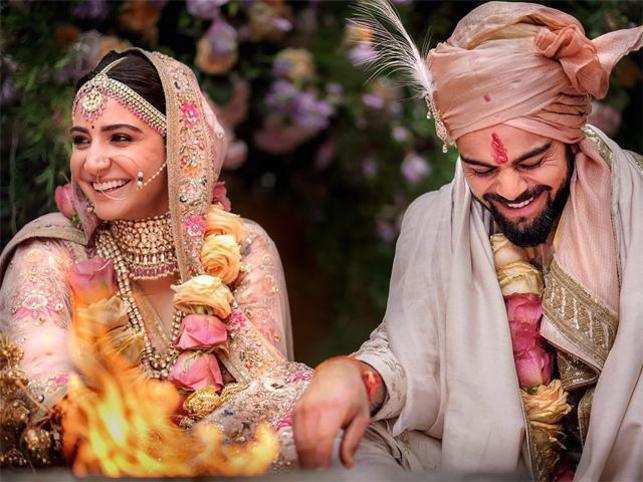 Both Virat and Anushka have posted online various wedding photographs, mainly on their Twitter accounts, in reply of which all their friends and well-wishers have showered them with best wishes. 9. They have planned to organize wedding receptions in Delhi and Mumbai after they return from Italy, where all the celebrities will be invited. 10. Finally, the new couple will be heading for their honeymoon trip to South Africa, as per the reported news. As per the uploaded photographs, this was surely a wedding that will be remembered by people for many days.